Keep your Apple AirPods case safe and sound—and in an easy-to-reach spot—with this handy holder. 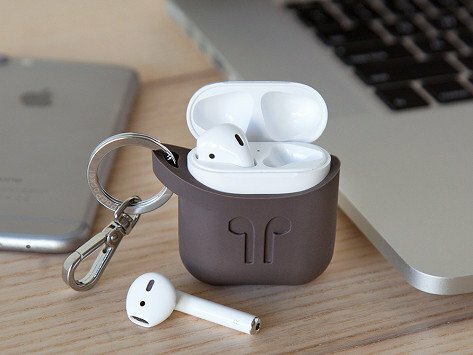 Made of flexible silicone, it fits snugly over the AirPods case and can be attached to a belt, bag, or keychain. Dimensions: 2.25" x 1.25" x 1.75"
Excellant case for Apple air pods! Protect your Apple AirPod case with a holder designed just for the job. PodPocket is made from flexible, high-grade silicone that is precision machined to fit snugly over the AirPod case. It adds a layer of protection, and makes it easier for you to access it when you want. AirPods are a bit of an investment, and their charging and storage case is quite small. On top of adding a layer of protection to their case, PodPocket makes it easier to find, by hooking onto a belt, bag, or keychain. It comes in an array of easy-to-spot colors to make for less digging around in your bag, and more listening.